Recently published, but likely written between 1958 and 1962, What Pet Should I Get? is the delightful tale of a definitive childhood event: selecting a family pet. The activities in this lesson focus on the decision-making process. 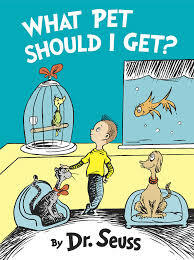 The text, told in the classic Seuss cadence and rhyme scheme, does an excellent job a describing the many choices the siblings encounter while trying to pick the perfect pet in a limited amount of time. With the repeating line “MAKE UP YOUR MIND” this picture book is a great tool for teaching choices and decision-making. Kay and her brother have a difficult decision to make. Their father has given them permission to select one pet from the pet store, and they must do so before noon. Students will likely recognize the characters in Dr. Seuss’s new book as the siblings from “One Fish Two Fish Red Fish Blue Fish” and sympathize with their dilemma. Once students hear the story they will have the information they need to help the brother and sister make an informed decision. It is to be noted that Dr. Seuss, with his usual wit and whimsy, does not identify the pet selected by the children. On the last page of the book Kay and her brother can be seen leaving the pet store carrying a basket with two eyes peering over the rim. In an extension activity, students will learn about some goods and services that are necessary to keep the new family member healthy and happy. Describe why wanting more than a person can have requires making choices. Discover that resources are scarce and as a result, choices must be made. Identify the concept of economic choice and apply this concept while participating in the creation of a classroom P.A.C.E.D decision-making grid. Distinguish the difference between goods and services. Seussville , the author’s website, contains many lessons and activities. Introduce the lesson using the illustration on the back of the book’s cover and the activity sheet, "Kay Makes a Choice"
Display the visual, "What Pet Should They Get?" and engage the students in a lively discussion, soliciting their opinions and recording their responses. Use the P.A.C.E.D. Decision-Making Guide to solve problems related to school situations. Use the story's content to teach goods and services using the "What Pet Should I Get? Goods and Services" activity sheet. Note to Teachers: This lesson is designed for primary students, grades K-2 and is basically teacher directed. However, the lesson can be easily modified for upper elementary students, using the visuals as activity sheets. The book’s extensive notes from the publisher would be of interest to middle school students who may be curious about the manuscript’s discovery and the process of getting it ready for publication. 1. Introduce the lesson by telling the students they will be listening to the new book “What Pet Should I Get?” written by Dr. Seuss. Explain that this book was written many years ago, and was recently discovered in a box. 2. Read the book to the students. This takes three minutes. 4. Show the students the illustration on the back cover of the book. (If possible, project it using a document camera.) 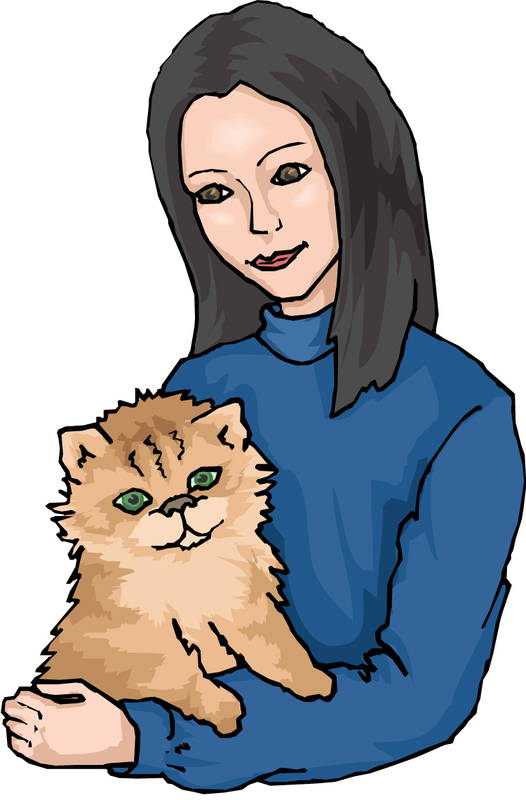 This illustration shows the sister, Kay, looking at a list of pets with check boxes next to their pictures. Ask the students if they think she is using this checklist to help her make a choice. Tell the students they will now participate in an activity that will help them understand the concepts of decision making and opportunity cost. 5. Display the visual “Kay Makes a Choice." Read the introduction and take a classroom vote. Record the votes in the boxes. Read the narrative on the bottom half of the visual to the students, emphasizing that when a choice is made something is given up. 6. Display the “What Pet Should They Get?” visual. Tell the students they are now going to help Kay and her brother make a choice. 7. Tell the students that this grid would be helpful to Kay and her brother. It lists some of the pets available at the pet store: cat, dog, fish, bird, and yent. State that getting no pet is also a choice. 8. Explain that the criteria listed are things that the siblings should consider when choosing their new pet. They live in a small house so it would be best if the pet did not require much space. They go to school, so they don’t have too much time to spend taking care of a pet. They do not want to spend too much money on food, grooming, and health care. And they would really like a pet that would be fun and love them. 9. Describe the process of filling in the grid by telling the students that a plus sign (+) should be placed on the grid for anything positive and good. A minus sign (-) will be placed on the grid for anything negative and bad. And a zero (0) for anything that is not good or bad. For example, a cat doesn’t take up much space, so a + sign will be written in the block for “cat” and “space.” Note: If some students express that one of the criteria has more importance or value than the others allow the one in question to receive a doubled score, either two pluses or minuses. Explain to the students that the construction of this grid helps with rational decision making. (But sometimes you make a choice with your emotions. You pick the puppy because it is really cute and jumps into your arms). 11. Ask the students the following questions, accepting all reasonable answers. 1. What pet should the brother and sister choose? 2. Why do you think this would be a good choice? This lesson uses the content in a picture book to teach young students about choices and gives them a tool to use in decision making. The lesson can be extended to include an activity featuring goods and services. Students may be interested to learn that Dr. Seuss was an animal lover. Many of his books featured animals, either real or imaginary, as main characters. The information in the back of the book explains that if this story was written today, and not many years ago, Dr. Seuss may have made another choice. He may have sent Kay and her brother to an animal shelter or rescue organization to look for a new pet. If Dr. Seuss had selected an animal shelter, then the pet store may have been the opportunity cost. Introduction: Once Kay and her brother bring their new pet home they are going to need to make sure it stays happy and healthy. In order to do this they will need to provide goods and services for their pet. 2. Ask the students to look at the illustration and point out the items used by the pets so that they will be safe, happy, and healthy. Students will notice the beds, food dish, water bowl, lease, and collar. Explain that these are goods, physical items that can be touched. State that if the boy had offered to take the dog for a walk he would be providing a service, an action, for the pet store owner. 3. Distribute the "What Pet Should I Get – Goods and Services" activity sheet and writing tools. Review the directions with the students. 4. Students may work in pairs or small groups. 5. Check for understanding: 1. Good, 2. Service, 3. Good, 4. Good, 5. Good, 6. Service, 7. Good, 8. Good, 9. Service, 10. Good, 11. Good, 12. Service. Answers: 1.$5.00, 2. 3, 3. A bag of treats, 4. A blue bowl, 5. Opportunity Cost, 6. Save. This assessment may be done as a teacher directed read-aloud for younger students.